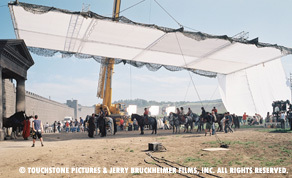 The primary purpose of location agreements is to secure the use of a location at particular times for the production of the film. It is vitally important that times agreed for the use of the location are not too restrictive on the production and the widest flexibility is maintained. The location agreement also covers the right of the production company to use the location in a context other than the actual context of the location itself eg a pub as a brothel without the owner having a claim against the producers for doing so. Other elements in a location agreement include a provision that the production company is covered by insurance so that the owner of the premises will not end up being liable for anybody who is injured while on the premises and also to cover damage to the property. The owner will also be concerned to see that the premises is reinstated to its former condition after its use. A particular issue in relation to location agreements is that it is vitally important to make sure that the producer is dealing with the owner of the premises. For major locations, this should be checked with the producers lawyer as it has sometimes occurred that deposits have been paid to persons who it transpires are the not the legal owners of the premises. It is also vitally important to make sure that the owner has exclusive ownership and that the owner has not granted a right of way to a third party who decides to use it just at the time filming is taking place. Also owners may have obligations to neighbouring premises eg in respect noise etc which may need to be taken in account.